We recommend you arrange a meeting with the TGA prior to submitting an application for evaluation of a substance for use in listed complementary medicines. See Pre-submission meetings with the TGA for details on arranging a meeting. There is no fee associated with a pre-submission meeting. The purpose of the meeting is to ensure that you are aware of the legislative requirements for ingredients used in listed complementary medicines and the data required for a submission to be accepted for evaluation. If it is determined at the meeting that the proposed data dossier is likely to be critically deficient, you have the opportunity to address these deficiencies prior to submitting the application. All data should be submitted at the time you lodge your application. Omitting relevant data from your application may jeopardise the acceptance of your application or cause unnecessary delays in the evaluation. The TGA will acknowledge receipt of your application and provide you with an invoice and an application number that you should reference in all communication on the application. In general, screening aims to identify applications that, for whatever reason, are unacceptable, for example: the data dossier is insufficient. Only critical deficiencies in the dossier will be identified at this stage. The administrative screen confirms that the correct application level has been selected, all fields on the application form have been completed and the correct application fee has been paid. If these basic requirements are not met, we will not accept the application for evaluation. The technical screen determines whether the data requirements for the selected application level have been met. Applications that are accepted in the screening phase progress to the evaluation phase. You will be notified in writing that the application has been accepted for evaluation and an invoice will be issued for the evaluation fee. The evaluation process will not commence until the evaluation fee has been paid in full. The evaluation fee will not be refunded if the application is withdrawn during the evaluation phase. If your application is not accepted for evaluation, you will receive a letter explaining the reasons why. Any other administrative matters in relation to the application will be discussed with you directly. The application fee will not be refunded if your application is not accepted for evaluation. The substance is not eligible for use in listed complementary medicines (see Substances eligible for evaluation for use in listed complementary medicines). Any portion of the application fee remains outstanding. There is gross deficiency or insufficiency of information. No appropriate justification is provided to address data gaps, for example: if substance specific toxicological data are not available, you should provide toxicological data from similar substances or evidence of history of use in other jurisdictions. Please note that the adequacy of the justification will not be evaluated at this stage. Data will be reviewed to determine if the substance is of sufficiently low risk to be used in listed medicines. The same evaluation process applies for substances proposed for use as active or excipient ingredients. The quality aspects (such as: chemical identity, manufacturing process, process controls and stability) are evaluated for the purpose of characterising the substance (identifying the physical and chemical properties). Where there is a default standard for the substance, the quality of the substance is assessed against that standard. Where there is no specific default standard applicable to the substance, a TGA compositional guideline is required. The safety evaluation determines whether the toxicological profile of the substance meets the requirements for the purpose for which it is to be used and is, therefore, considered safe to be used as an ingredient in listed medicines. Although efficacy of a substance is not assessed, the evaluation process includes consideration of the proposed therapeutic indication(s) for medicines (containing the proposed ingredient) in order to determine if the proposed ingredient is safe at the dose, route of administration and duration of exposure required for therapeutic effect. For example, when evaluating a substance that is proposed to be used as an ingredient indicated for long-term use, we will consider whether submitted safety studies are of sufficient duration. In addition, clinical and other efficacy data, while not evaluated from an efficacy perspective, often include information on adverse events that is useful in the safety evaluation. When a permitted ingredient is included in a new, the sponsor of the medicine is required to certify (under section 26A of the Act) that they hold evidence to support the indications and claims made for their medicine. It is a condition of listing that the sponsor of the medicine must provide this evidence to the TGA, if requested to do so. The medicine may be cancelled from the ARTG if any of the sponsor's certification under specified provisions of section 26A of the Act is found to be incorrect. The TGA may make a request under subsection 26BE(2A) of the Act for additional information to clarify or address issues identified during the evaluation. The time between the RFI being issued and receipt by the TGA of the applicant's response will not be counted as part of the evaluation timeframe (the 'evaluation clock' will stop). Evaluators may also seek clarification of minor issues on an informal basis and in these circumstances, the evaluation clock will not stop. You will be informed that a committee's advice is being sought and given opportunity to provide comment for the committee's consideration. Subsequently you will be informed of any relevant advice given by the committee. If the application is refused, you will be advised in writing as soon as practicable and provided the reasons why it was not successful. Applicants requesting an evaluation of a substance for use in listed complementary medicines can appeal the Secretary's decision about that application under section 60 of the Act. If the Secretary makes a recommendation, a TGA delegate of the Minister will then make a final decision to vary the Permissible Ingredients Determination to include a new ingredient or refuse to do so. If an ingredient (active or excipient) is determined to be suitable for use in listed medicines, the approved ingredient is added to the Permissible Ingredients Determination for use in listed medicines. All permissible ingredients are also made available in TGA Business Services. If an exclusivity period for use of the ingredient is applicable, this will be included as a requirement for the ingredient in the Permissible Ingredients Determination. 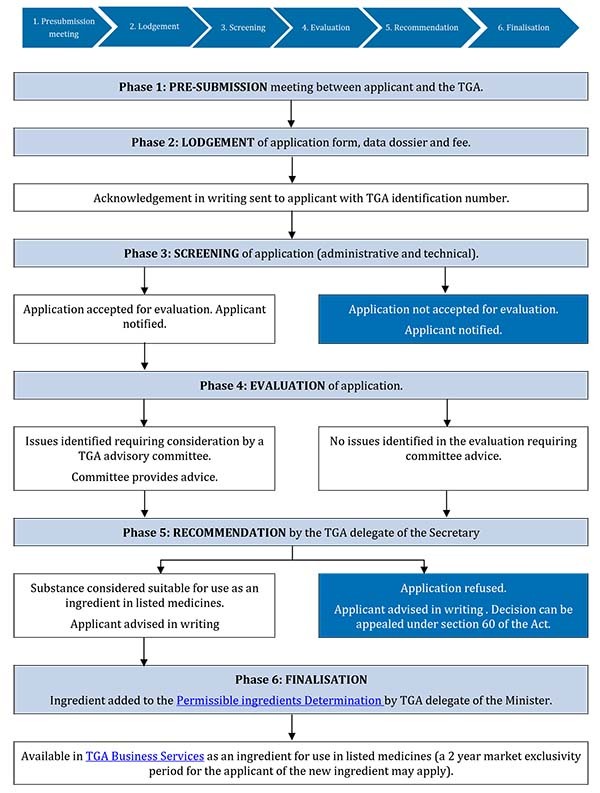 Chart C1 illustrates the application stages and evaluation process for the evaluation of a substance for use in listed complementary medicines. This text representation of Chart C1 is provided as a list with numbered steps. Phase 1: PRE-SUBMISSION meeting between applicant and the TGA. Phase 2: LODGEMENT of application form, data dossier and fee. Acknowledgement in writing sent to applicant with TGA identification number. Phase 3: SCREENING of application (administrative and technical). Application accepted for evaluation. Applicant notified. Go to Step 5. Application not accepted for evaluation. Applicant notified. End flowchart. Phase 4: EVALUATION of application. Issues identified requiring consideration by a TGA advisory committee. Committee provides advice. Go to step 6. Application not accepted for evaluation. Applicant notified. Application refused. Applicant advised in writing. Decision can be appealed under section 60 of the Act. End flowchart. Ingredient added to the Permissible ingredients Determination by TGA delegate of the Minister. Available in TGA Business Services as an ingredient for use in listed medicines (a 2 year market exclusivity period for the applicant of the new ingredient may apply).